In our repair kit we’ve collected all the parts you’ll need to repair your teak monkey so it can be complete again. If the pictures and text instructions aren’t enough, then try our video. Start by removing all the parts from the bag and placing them in front of you. Remove any old pieces of elastic or nails from the monkey’s arms or legs. 1. Wrap the string around the elastic band. 2.Using the string, guide the elastic band through the leg/arm and position it as shown in the picture. 3. 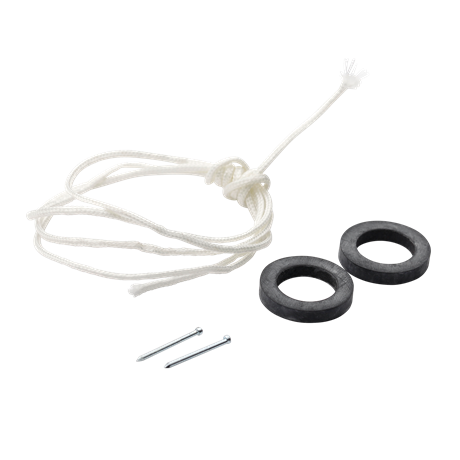 Place the nail in the hole at the top – without damaging the elastic band. A nail punch can be used to press the nail down. If the nail won’t go down, adjust the elastic band. 4. Next, pull the string through the torso and thread the other leg/arm onto the string. 5. You can also use a door handle to do this, as shown in the picture, positioning the nail in the same way as for step 3. above. 6. Cut the string and pull it out – and your monkey is ready for new adventures!